Sint Maarten is a constituent country of the Kingdom of the Netherlands and is the southern half of the island of Saint Martin (the northern half is the French Collectivity of Saint Martin). The islands of Saba and Sint Eustatius are public bodies of the Netherlands. The acronym is analogous to the ABC islands, consisting of Aruba, Bonaire and Curaçao, and the BES islands, consisting of Bonaire, Sint Eustatius and Saba, both of which are also part of the Kingdom of the Netherlands. All six island territories were formerly part of the Netherlands Antilles. 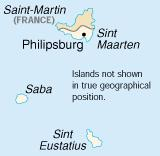 Saint Martin was split between the Netherlands and France in 1648. The Dutch part became a single Dutch colony in 1818 as Sint Eustatius and Dependencies when France returned its possessions after the Napoleonic Wars. This colony was merged with the colonies Curaçao and Dependencies (the ABC islands) and Suriname with a capital in Paramaribo. When this merge was partly reversed in 1845, the Dutch part of the SSS islands became part of Curaçao and Dependencies with Willemstad as capital. This colony became the Netherlands Antilles in 1952. The Dutch part of the SSS islands initially formed the single "island area" (Dutch: eilandgebied, the main administrative division of the Netherlands Antilles, governed by an Island council) the Leeward islands (Dutch: de Bovenwindse eilanden) until 1983. This Sint Maarten location article is a stub. You can help Wikipedia by expanding it. This Saba location article is a stub. You can help Wikipedia by expanding it. This Sint Eustatius location article is a stub. You can help Wikipedia by expanding it. This page was last modified on 20 January 2015, at 05:30.